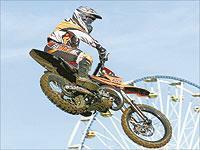 The World Motocross championship arrives in Italy this weekend for round five in Castiglione de Lago. Although there aren’t many Italian contenders entered, there are some good hopes for British riders. Jamie Dobb and teammate Gordon Crockard finished fifth and seventh at the last round in France for KTM in the 250 class, and will both be looing for a result in Italy that could lift them from eighth and tenth in the championship. Fellow Brit Paul Cooper will also be looking to go even better than his sixth place. There will also be Stephen Sword in the 125s, and James Noble and Stuart Flockhart in the 500s. The main contenders in the 250s look to be Josh Coppins, Pit Beirer, Frederic Bolley, Kenneth Gundersen and reigning champion Michael Pichon, and Dobb will have to overcome a lack of track knowledge as this will be his first visit to the track.